These terms of service (here in after known as “Agreement”), govern your acquisition and use of Qiscus’ solutions, both for the trial and paid versions or plans. By proceeding to sign up, register, or access Qiscus’ solutions, you are agreeing to the terms of service stated in this Agreement. “Qiscus” means Qiscus Pte Ltd, located at 2 Orchard Link, #04-01, Singapore (237978), and its subsidiaries or affiliates, including PT Qiscus Tekno Indonesia. The Customer and Qiscus shall hereinafter be individually referred to as "Party" and collectively as “Parties". “Qiscus Solution” shall mean the set of client and server software applications licensed to the Customer by Qiscus, as well as other services rendered to Customer by Qiscus. This includes, but not limited to, Qiscus’ Chat Software Development Kit (SDK), Omnichannel/ Multi-channel Customer Service Chat (Qismo) as well as the accelerator packages for enterprise messaging or online consultation solutions. A user is counted as “Monthly Active User” or “MAU” when he/she connects to Qiscus’ servers by using Qiscus Solution from his/her application, within a calendar month. A connection is required to do any types of communication between clients and servers. Without a connection, clients will not be able to send messages, listen for new messages, read/retrieve past messages, update user profile etc. “Customer Data” means data or content contained in the messages or data streams published by Customer or its users to the Qiscus Solution. "Uptime Percentage" is calculated by subtracting from 100% the percentage of minutes during the month in which the Qiscus Solution, as applicable, was in the state of "Unavailable." Uptime Percentage measurements exclude downtime resulting directly or indirectly from any Qiscus Exclusion (as defined below). "Qiscus Exclusions" shall mean: Any unavailability, suspension or termination of Qiscus Solution performance caused by factors outside of Qiscus’ reasonable control. This includes force majeure events, scheduled maintenance or maintenance requested by the Customer, or the suspension and termination of the Customer's right to use Qiscus Solution in accordance with the Order Form (collectively, the "Qiscus Exclusions”). “Order Form(s)” means the form evidencing an order for Qiscus Solution submitted online or in written or electronic form, specifying, among other things, the Effective Date, the applicable Fees, the billing period and others. Each such Order Form is automatically incorporated into and becomes a part of this Agreement. "Unavailable" means that Qiscus servers servicing traffic either do not respond at all or respond erroneously with unexpected results. “Intellectual Property Rights” means all (i) copyrights (including, without limitation, the right to reproduce, distribute copies of, display and perform the copyrighted work and to prepare derivative works), copyright registrations and applications, trademark rights (including, without limitation, registrations and applications), patent rights, trade names, mask-work rights, trade secrets, moral rights, author’s rights, privacy rights, publicity rights, algorithms, rights in packaging, goodwill and other proprietary rights, and all renewals and extensions thereof, regardless of whether any of such rights arise under the laws of the Singapore or any other state, country or jurisdiction; (ii) intangible legal rights or interests evidenced by or embodied in any idea, design, concept, technique, invention, discovery, enhancement or improvement, regardless of patentability, but including patents, patent applications, trade secrets, and know-how; and (iii) all derivatives of any of the foregoing. “Trademarks” means all common law or registered trademark, service mark, trade name and trade dress rights and similar or related rights arising under any of the laws of Singapore, Indonesia or any other country or jurisdiction, whether now existing or hereafter adopted or acquired. Subject to the terms of this Agreement, Qiscus grants to Customer and Customer accepts from Qiscus a non-exclusive, non-transferable limited license and right to access the Qiscus Solution. Customer understands that the technical processing and transmission of the Qiscus Services, including any Customer Data provided by Customer, may involve (i) transmissions over various third party networks, and (ii) changes to conform and adapt to technical requirements of connecting networks or devices, and Customer consents to such transmission and changes. Each party shall strictly comply with all standards with respect to the other party’s marks which may be furnished by such party from time to time. Qiscus may identify Customer by name, with or without use of the Customer’s trademark, in general promotional lists of Qiscus' customers without Customer’s prior consent. Customer shall not do any of the following: (i) distribute, sell, assign, transfer, or sublicense the Qiscus Solution, or any part thereof, to any third party; (ii) except as specifically set forth in this Agreement, adapt, modify, translate, reverse engineer, decompile, disassemble, or create derivative works based on the Qiscus Solution or any part thereof (iii) copy any of Qiscus Solution, in whole or in part, without including appropriate copyright notices; and/or (iv) utilize Qiscus' sandbox environment for commercial use, use in an app store or app marketplace, or in a manner that is noncompliant with the restrictions set forth by Qiscus. Delivery of Qiscus Solution. Subject to the terms and conditions of this Agreement, Qiscus shall provide to Customer the Qiscus Solution together with support packages and their corresponding SLAs (where applicable) which Customer has signed up for. Failure to make timely payment to Qiscus, despite reminders sent to Customer’s registered email address. Availability. Qiscus commits to an uptime of 99%. The Qiscus Solution shall be usable 99% of the time (tracked on a monthly basis). Troubleshooting / installation support via email only. 2-business day guarantee responses for all issues. All business and technical support is provided through email, live chat, remote connections/access share and phone. No named contacts (for priority support which is only available for the paid support packages). The paid support comes in 3 different packages: Premium (I), Premium (II) and Dedicated Support. Customer’s subscription fee is based on Monthly Active Users (MAU) and additional services requested (such as Professional Services and Add-ons), as agreed upon by both parties. Services Fees. Services fees will be subjected to a 30-day terms of payment and/or other terms of payments pre-agreed by both parties. Any late payment may result in termination of services by Qiscus. Subscription Fees. Subscription fees may be paid on a monthly or annual term of payment and shall remain fixed unless customer (i) exceed the Maximum MAU limit (pegged to each pricing tier), (ii) upgrade products or base packages, (iii) subscribe to additional features or products, including additional MAU, or (iv) other reasons which shall be specified in writing. Holding Period. For monthly or annual subscription fees, Customer is given 7 days to make the necessary payment, from the date of invoice. This period is the holding period. Once the holding period is over and no payment is received, Qiscus reserves the right, but not obligation, to deactivate Customer’s account. Reactivation. Customer may reactivate its account from its own admin dashboard and/ or by contacting Qiscus’ technical support to reactivate its account. Reactivation is only allowed upon the settlement of any outstanding invoices. Qiscus may increase or add new fees and charges for any existing solution/services that the Customer is using by giving at least 30 days’ prior notice to the Customer. All payment obligations are non-cancelable and all amounts paid are non-refundable, except as specifically provided for in this Agreement. All fees are due and payable in advance throughout the Subscription Term. All Subscription fees can only be paid through the use of cards: When Customer is paying by card, Customer authorises Qiscus to charge its card or bank account for all fees payable during the Subscription Term. Customer further authorise Qiscus to use a third party to process payments, and consent to the disclosure of Customer’s payment information to such third party. This Agreement shall commence on the Effective Date and unless otherwise indicated on an Order Form, shall continue until on a month-to-month basis until terminated. No Refunds. Qiscus does not provide refunds if Customer decides to terminate the agreement in the middle of the month (for monthly terms of payment) or within the period of 1 year (for annual terms of payment). Qiscus may terminate this Agreement, without cause, upon providing Customer with thirty (30) days prior written notice. Notwithstanding the foregoing, Qiscus reserves the right to fully or partially discontinue, at any time and from time to time, temporarily or permanently, any free, trial, or beta versions with or without notice. Upon expiration or termination of this Agreement, all licenses granted to the Qiscus Solution shall expire. Qiscus shall discontinue the provision of the Qiscus Solution, and Customer shall immediately pay any outstanding invoices for services rendered through the date of termination. Unless otherwise agreed between the Parties in writing, strictest commercial confidence shall be maintained with respect to all information received/given, including but not limited to, fee arrangements, business and marketing strategies and decisions, unless explicitly required under law. Where so required to disclose such information, all parties shall ensure that all parties are aware of this where possible and reasonable to do so. For this purpose, the Parties shall enter into a Non-Disclosure Agreement if necessary. Upon expiration or termination of an Order Form for any reason or at the written request of either Party during the term of an Order Form, the other Party shall promptly return or destroy all the Confidential Information. Customer agrees to indemnify, defend and hold harmless Qiscus from any claims, demands or causes of action by any third party that relate to this Agreement. Any controversy, dispute or claim arising out of, or related to this Agreement by either party shall be settled by arbitration, in accordance with the rules, then applicable, of the Singapore International Arbitration Centre; and the parties hereto agree that the decision or award thereby shall be final and shall be binding on all parties. This Agreement contains the entire Agreement between the parties here to and supersedes all prior and contemporaneous Agreements, negotiations and understandings between the parties hereto, relating to the subject matter hereof, and except as noted in this agreement. There are no other understandings, statements, promises, or inducements, oral or otherwise, contrary to the terms of this Agreement. No representations, warranties, covenants or conditions, express or implied, whether by statute or otherwise, other than as set forth herein have been made by any party hereto. No waiver of any term, provision, or condition of this Agreement, whether by conduct or otherwise, in any one or more instances, shall be deemed to be, or shall constitute, a waiver of any other provision hereof, whether or not similar, nor shall such waiver constitute a continuing waiver, and no waiver shall be binding unless executed in writing by the party making the waiver. Nothing in this Agreement whether express or implied, is intended to confer upon any person other than the parties hereto and their respective heirs, representatives, successors and permitted assigns, any rights or remedies under, or by reason of, this Agreement, nor is anything in this Agreement intended to relieve or discharge the liability of any other party hereto, nor shall any provision hereof give any entity any right of subrogation against, action over or against any party. BOTH the Customer and Qiscus shall not voluntarily or by operation of law assign or otherwise transfer the obligations incurred on its part pursuant to the terms of this Agreement without the prior written consent of the other party. Notwithstanding the foregoing, Qiscus may assign or transfer this Agreement or any rights or obligations hereunder without Customer’s consent to a third party acquirer of all, or substantially all, of the assets or business of Qiscus, whether by sale, merger, or otherwise. Except as provided in this section, any attempts by either Party to assign any of its rights or delegate any of its duties hereunder without the prior written consent of the other Party shall be null and void. Should any part, term, or provision of this Agreement, or any documents required herein be declared invalid, void, or unenforceable, all remaining parts, terms and provisions hereof shall remain in full force and effect and shall in no way be invalidated, impaired or affected thereby. other unforeseeable circumstances beyond the control of the either Party, against which it would have been unreasonable for the affected party to take precautions and which the affected party cannot avoid even by using its best efforts. We are enabling conversations around the world because we believe that's what keeps everything going. Are you in? Get me a chat feature in my app/web! Connect all my channels as one! Want to know more? Let’s talk! Download our latest white paper! 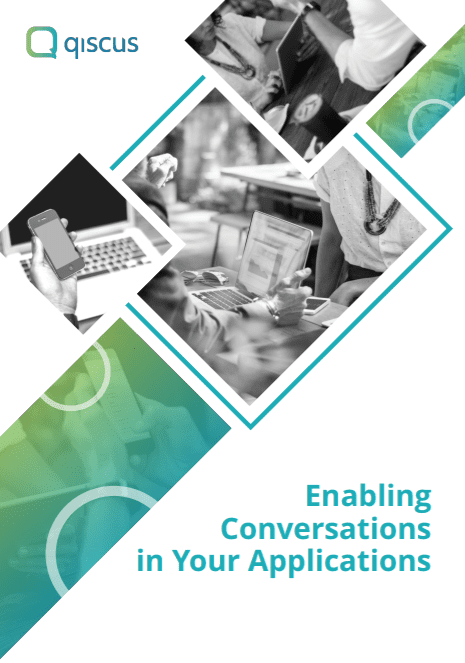 Download Qiscus White Papers to learn about real-time communication technology, trend, and solution for your business. Interest to hear more about us? Join our subscriber list and get the latest update about Qiscus.